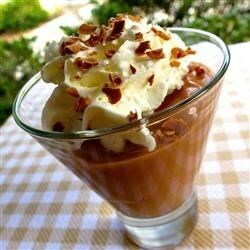 A very quick and easy way to make something like mousse that is quite healthy and great for the family. The ingredient amounts can be altered according to the cook's desire to have a more or less chocolatey concoction. Different kinds of chocolate can be used also, like dark chocolate." Put the chocolate bar into a microwave-safe bowl and add the milk. Microwave until the chocolate is soft and melted, about 30 seconds. Stir Greek yogurt into the chocolate mixture until smooth.